You Are Listening To "You Are My Sunshine." We've taken the off ramp from the Pennsylvania Turnpike to pick up some snacks in HERSHEY, PA.
Don't they look tempting? 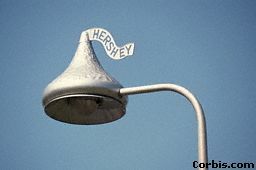 Hershey, of course, is the home of the Hershey Chocolate Factory. That's not the only thing in Hershey. They have a wonderful theme park and some great golf courses. Bet you've never seen a street light like this anywhere else. They're a Hershey trademark. 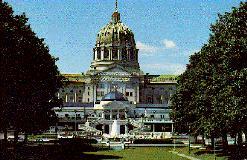 OK, back to turnpike for a short drive to HARRISBURG, PA.
Harrisburg has been the capital of Pennyslvania since 1812. We're going to swing by a couple of places before we head southwest. This is the State Capitol Building. It's copper dome has the natural green patina peculiar to this metal when it is exposed to the weather. 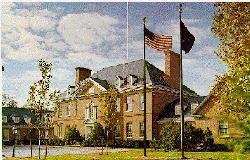 The Governor's Residence is fairly new, being built in 1968. As we move on down the highway, you can see Harrisburg in the rear view mirror. Now, let's go see where the bloodiest battle of the Civil War took place. 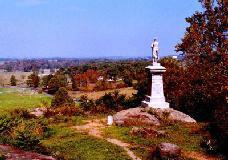 Gettysburg is the site of the largest Civil War battle ever waged. 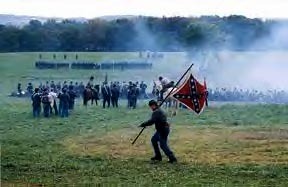 It opened on July 1, 1863 and closed two days later with "Pickett's Charge." It resulted in Union victory, and ended the Civil War. 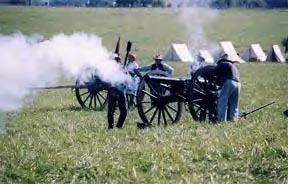 Over 51,000 soldiers were killed, wounded or captured, making it the bloodiest battle of the Civil War. 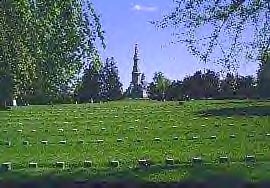 The Soldier's National Cemetery was created to properly bury Union soldiers who died at Gettysburg. 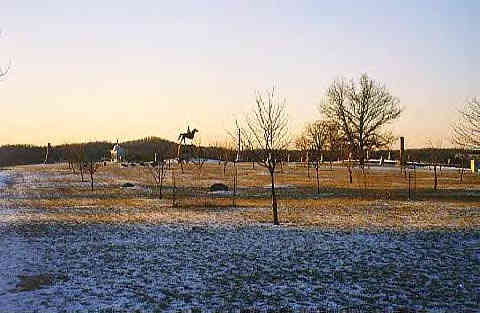 The Soldier's Cemetery was established on the battleground near the center of the Union Line. The soldiers at Gettysburg were not bothered by winter weather as was the Continental Army at Valley Forge. 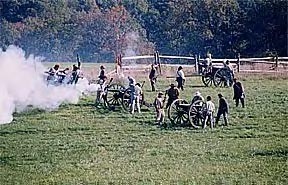 The next three pictures were taken at a reenactment of the Battle of Gettysburg. "...AND THAT GOVERNMENT OF THE PEOPLE, BY THE PEOPLE, FOR THE PEOPLE, SHALL NOT PERISH FROM THE EARTH" (Gettysburg Address). If you're all ready, let's hop back in the Chevy and we be driving west. Click on the license plate, and let's see where the Chevy is going to take us next..